This past Sunday my family and I attended a celebration that stirred memories of our young adult lives and childhood. We attended a “Bautismo” or baptism. It is one of the seven religious sacraments of the Catholic Church where an infant is initiated into the spiritual community of the Church. It has been many moons since our own children were babies and now that several of our extended family are not Catholic (except for my mother) we don’t attend baptism’s as often as we did in our childhood and young adulthood. Cultural traditions remind us of who we are and where we came from. That is why we were delighted that the young couple, college graduates, third generation Mexican American’s, followed the traditions of their culture and religion. Mexican and Mexican American baptisms have their own baptism rituals. The parents select godparents, or compadres, who traditionally have the duty of raising the child if the child’s parents were to die. This isn’t a legally binding contract, but more of a moral obligation or promise to bring up the child as a Catholic. After the pouring of the water on the baby’s head, the priest invites the parents to light a candle from the main candle at the altar. Prayers are said, the blessing of the oil takes place, and then the baby, parents and godparents are presented to the congregation. The next ritual is the throwing of bolos. 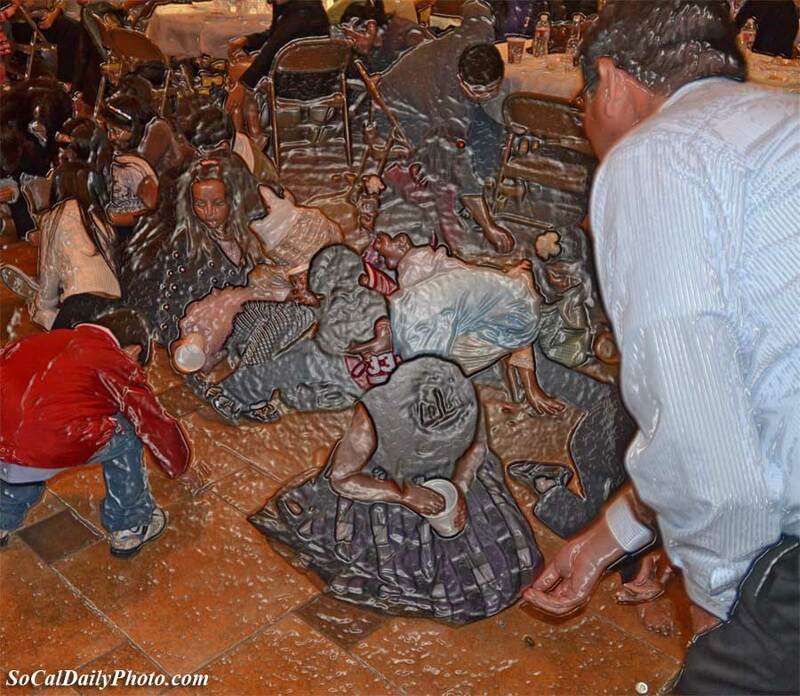 When we were children we lived in a predominately Mexican neighborhood, so bautismo’s and the ritual of the compadres throwing bolo was frequent. This is a gift of coins thrown to all the children attending the baptism. Bolo is said to symbolize prosperity and good luck for the infant. Usually bolo was done on the steps of the church after the baptism ceremony. Pennies, nickels and dimes rained upon the heads of children scrambling for coins. In those days you could buy nickel candy bars, so bolo was quite the event. You could imagine that children from all over, and some adults, frequented the church steps on Sunday late afternoons after baptism ceremonies. In our neighborhood, everyone knew that twenty something Petra, would be at every baptism. She was mentally disabled so she was given a pass. But now bolo is thrown at the reception party. A party takes place after the baptism, usually a backyard barbecue, for the family and friends of the parents. This is an opportunity for the extended family to get together and bring each other up to date. For us, the ‘old parents’ it was a time to reminisce about the baptismal parties we threw, how the years fly by, and how glad we are that the traditions we grew up with have not died out.